In Ancient Greek mythology, Poseidon, also known as Neptune in Roman lore, is considered the god of the sea. His supernatural powers allowed him to change personalities. And sometimes, he would even grant others the power to shape-shift. Even though Poseidon was one of the supreme Greek gods of Mount Olympus, he spent most of his time underwater. Poseidon was the god of every ocean, lake, sea and river. He did not get along with people. He had two very powerful brothers, Zeus and Hades, who were also powerful Gods in their own right. Zeus was the king of the gods and the sky. Hades was the king of the underworld and death. Together, the three ruled all the Earth. Poseidon almost had the same power as his brother Zeus, and Hades almost had the same power as Poseidon. 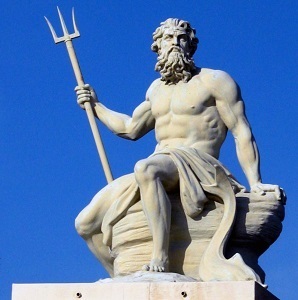 Poseidon had a powerful weapon, a trident. He used it to shake the world and create earthquakes. There were also gods that ruled the water, but Poseidon ruled them as well. Poseidon had many mythical relationships. He created the first horses because Demeter, the goddess of the harvest, asked him to. Eventually he married Amphitrite, daughter of Nereus. Poseidon was also the father of the hero Theseus. Even though there are a lot of gods, people will still create new stories about them or tell the same old stories. Although many people have stopped believing in them, the great tradition of telling their stories lives on.